Keurig k-cups are super convenient but they are not always the most affordable option. 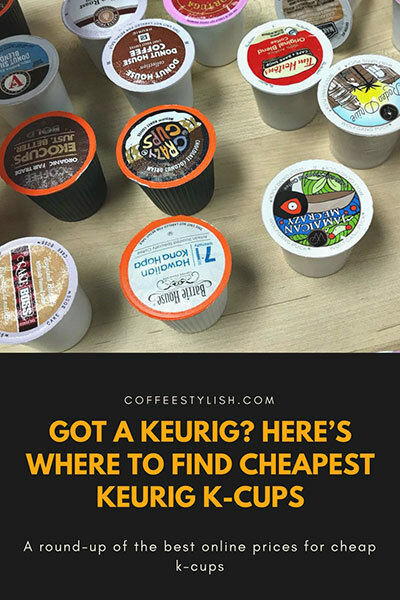 So, I thought it would be useful to share a few ideas on how to save money on k-cups, and where to buy them cheap. A great way to save on k-cups is to buy k-cups in bulk. The best places to buy k-cups in bulk are Costco and Sam’s Club (and of course, Amazon). You can get a 100ct box for $30 – $50. For example, 100 ct Original Donut Shop k-cup box retails for $47.00 at Sam’s club ($0.47 each) and you can get Maxwell House Breakfast blend k-cups for $34.98 ($0.35 each!). If you choose to subscribe you can save extra $1.50 – $2.00 per box. I stock up when I have a 20% or 30% coupon and the k-cups are on sale at Kohl’s. Many of the Kohl’s coupons can be used online, and you will often get free shipping with a code or purchase amount. When on sale, you can get an 18ct box for $11.99. Combine this with a coupon, Kohl’s cash and free shipping and you can sometimes get them for $0.35 each. You can also get a good deal at Bed, Bath & Beyond with a 20% coupon. If you aren’t hooked on a particular brand, shop the clearance racks. So far, I have found some amazing deals on clearance. Also, if you get a k-cup coupon, save it – just in case. A coupon can save you from $0.50 to $1.50 per box, so it’s a good thing to have one even if you don’t normally use coupons. Don’t forget to check the expiration date on the box. 1. Buy k-cups in bulk. This is the best option, especially if you have a favorite brand and you drink it all the time. 2. Choose small packages when buying a new flavor for the first time. There’s a chance that you won’t like the coffee, so it’s better to get a small box first. 3. At the grocery store, always check the expiration date on the box. If the k-cups are close to expiration date, they’ll probably be on sale. Buy only as much as you can drink before the date expires. 4. Use coupons (check coupon sites or your store website). A coupon can save you $0.50 – $1.50 per box. 5. Compare clearance price and regular price, then decide will the deal save you money or not. Don’t get a box of k-cups just because the sign says so. Switching to a reusable filter is one of the best things you can do for your wallet and for the environment. Depending on the brand, one regular k-cup costs from $0.40 – $0.60. Get some ground coffee and a reusable filter, and your cup of coffee will cost less than $0.20. That’s 50% – 65% savings! You’ll make zero waste and you’ll save a ton of money. Thank you so much for this guide! I got a Keurig for Christmas unexpectedly, so this is a great start. Wow, that’s a lovely present Brittany, I am glad I could help! I have some Keurig recipes on the blog as well, make sure to check those too. Happy holidays!! !